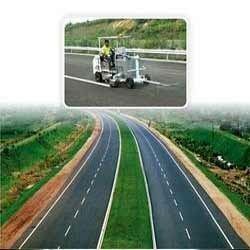 We offer Thermoplastic Road Marking Paint that is applied on the road surfaces in dividing lines. Our Thermoplastic Road Marking Paint is highly beneficial as compared to the conventional paints. It can be easily applied on asphalt and concrete surfaces by using a special primer. Clients prefer our Thermoplastic Road Marking Paint for features such as non-volatility, durability and good luminosity in heavy and dark rains. The Thermoplastic Road Marking Paints are also apt for marking the zebra crossings on the road. SUMOMARK range of Thermoplastic Road Marking Paint/markings includes hot applied retro reflective thermoplastic road markings conforming to clause 803.4, "Specifications for Road and Bridge Works" of Ministry of Road Transport & Highways. SUMOMARK has been widely used in the famed Golden Quadrilateral and NSEW project of NHAI and on various national and state highway projects across the country.